The Sony BDP-S380 is the entry-level Blu-ray player in Sony's 2011 lineup. While not as feature-rich as the step-up models from Sony or higher-end players from other makers, it offers pleasing picture and sound quality, versatile playback options for photos and music, and an easy-to-navigate menu system. Users looking for a basic Blu-ray player that don't see themselves needing or wanting 3D capabilities or a lot of bells and whistles will find a lot to like here. The BDP-S380 is able to stream video and audio content from the Internet via Sony's Bravia Internet Video gateway, which provides access to such services as Netflix, YouTube, Hulu, and Pandora, among others. Out of the box, however, the BDP-S380 can only access these services through a wired Ethernet connection. 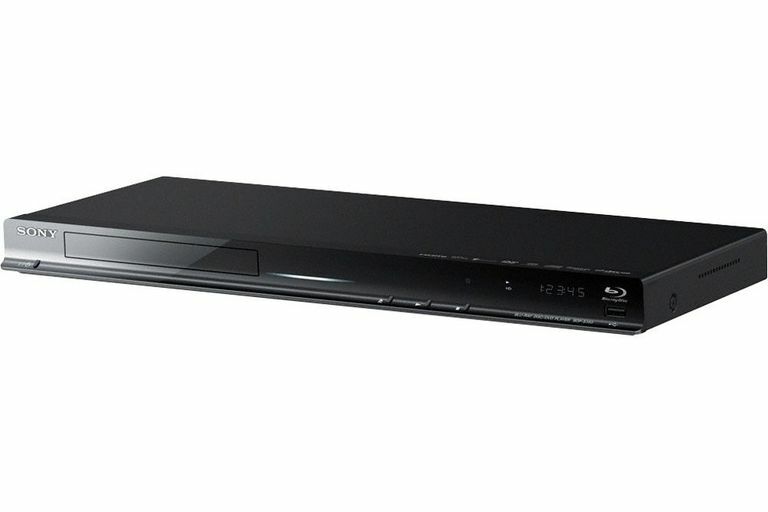 To connect to the Internet wirelessly with this Blu-ray player, you'll need to purchase Sony's optional UWA-BR100 wireless adapter. While the BDP-S380 comes with a remote control, Sony also offers a free, downloadable "Media Remote" app that lets an iPhone, Android Phone or an iPad work as a powerful remote controller for this Blu-ray player, as well as a typing keyboard for web-based content and services. For this feature to work, you will also need the Sony wireless adapter. 1. The BDP-S380 features full 1080p/24 playback resolution for Blu-ray discs with automatic (or selectable) optimization for film or video-based content. It is a 2D model only and does not play 3D content. 2. The BDP-S380 can upscale standard DVDs to match the resolution of a 720p, 1080i or 1080p high-definition TV through an HDMI connection. 3. The BDP-S380 is compatible with most major pre-recorded and recordable BD, DVD, and CD disc formats, including the super high-fidelity SACD music discs. 4. Standard audio-video connections include HDMI, component video (red, green, blue), coaxial digital audio, and composite video with analog stereo audio (yellow, red, white). 5. Connections for non-disc content such as digital photos or MP3 music from your flash drive are provided by a front-panel USB 2.0 port. There's a second USB port in the rear of the unit that provides the memory to store BD-Live content from the Internet; the BDP-S380 has no internal memory capabilities. 6. Connection to the Internet is via a standard Ethernet jack and an Ethernet cable from your home network unless you're using Sony's optional wireless adapter. 7. A downloadable Media Control app is available to control the BDP-S380 from an iPhone, iPad or compatible Android phone. This app requires the optional wireless adapter and also lets the user enter searches, comments, and Tweets. 8. A graphical user interface allows menu selections and key setting adjustments even when a BD disc or streamed content is running. 9. A "Quick Start" feature shortens the wait time between disc loading and disc playback. The graphical menu system for the BDP-S380 is clear and easily navigated. Powering it on for the first time brings up an "Easy Setup" menu for language, TV type, and internet connections. You can set up all the system preferences here at the start or return to any fine adjustments later by returning to the full Setup menu. To speed up disc load times, which are often leisurely in BD players, the BDP-S380 offers a Quick Start feature that can open the tray in less than 3 seconds and start (or resume) a Blu-ray movie in about 12 seconds. This feature more or less leaves the unit "on" all the time, though in a low-energy state. Without this feature engaged, it takes around 30 seconds for the BDP-S380 to start the movie, which is slightly faster than most current BD players. The Sony BDP-S380 offers all the up-to-date audio codecs and playback compatibilities, including Dolby TrueHD, DTS, and of course, Dolby Digital. Sound through each of these surround sources was clear and detailed, and stereo playback for standard compact discs was very satisfying on everything from hard rock to choral music. One unusual feature here is the inclusion of SACD (Super Audio Compact Disc) compatibility. While this high-resolution audio format never took off with the mass market, it is still arguably the best possible sound source available to consumers, and there are thousands of titles available, particularly if you're a fan of jazz or classical music. If the rest of your audio system is very high quality and you don't mind buying music online, this feature alone is a great upgrade. These discs go past CD sound to a new level of resolution and clarity, much the same as the improvement from DVD pictures to Blu-ray. The BDP-S380 presents a smooth, colorful, noiseless 1080p picture with Blu-ray discs. Even on a large 60-inch monitor, images were supple and lifelike, without the artificial-feeling "digital" look that some inexpensive players produce through too much (or too cheap) video processing. Blacks are deep and the picture contrast reveals plenty of subtlety, even in dark scenes. The candlelit basement shootout sequence in Inglorious Basterds showed a tremendous range of shades even though the director's deliberately monochrome look. Classic "eye candy" Technicolor movies were similarly enjoyable through the BDP-S380, with the rich palette of Quo Vadis popping on the screen but never becoming exaggerated or oversaturated. The BDP-S380's ability to upscale conventional DVD content for high definition output was quite good for a player at this price point. With high-quality upscaling, an existing DVD library becomes much more fun to watch and surprisingly close to a truly high-definition experience. The BDP-S380's DVD upconversion is so effective that you may find yourself perfectly happy renting or buying DVDs, and not worrying about why your favorite titles haven't shown up on Blu-ray yet. There are several enhancements available on the BDP-S380 that are designed to compensate for the imperfections in picture quality you often find with YouTube and other less robust video sources. One, called BNR (Block Noise Removal) helps remedy the blocky, pixelated look that comes from poor source material or Internet streams. Another more subtle enhancement called MNR (Mosquito Noise Reduction) minimizes the buzzy artifacts that sometimes show up in the edges of shapes and in big areas of solid color. An additional picture setting can balance the overall brightness and contrast for your specific room lighting (Daylight, Theater). For this review, we left all of these disengaged. The BDP-S380 offers compatibility with popular online content services like Netflix and Hulu, and free video sites like YouTube through a proprietary portal environment called Sony Bravia Internet Link. In addition to the above-named content services, this portal also lets you use "widgets" for instant weather, sports scores and the like. As previously mentioned, this player can only connect to the Internet via an Ethernet cable wired to your home network, or through an optional wireless adapter that plugs into the rear of the unit. Since this adapter costs an additional $79, you might want to think about a step-up model from Sony if you're unable to run an Ethernet cable to this player. Sony's higher-end BDP-S580 ($199) has Wi-Fi built in. Sony's BDP-S380 offers an attractive value proposition. Despite its modest price, you get very good Blu-ray playback and DVD upconversion that makes your existing DVD library look almost as good as Blu-ray. While it's not compatible with 3D content, most people don't have a 3D TV, and if we're to believe current sales trends, a lot of folks aren't particularly interested in getting one. In many home theaters and other places where TVs generally live (like bedrooms), people often just want a great 2D picture and surround sound quality that feels theatrical. In this regard, the BDP-S380 more than fills the bill. While compatible with the popular online services that people are asking for these days, the BDP-S380's lack of Wi-Fi may be a turnoff to many potential buyers. For less than the $79 asking price for the proprietary Sony wireless adapter, you can upgrade to Sony's BDP-S580 or a competing model with Wi-Fi built in. If your home network's router isn't too far from where you'll be placing this Blu-ray player, a simple Ethernet cable solves this shortcoming, but not every home will have that advantage. There are a lot of Blu-ray players out there that can be had for the BDP-S380's modest $149 asking price (lower at many retailers), but few of them deliver the excellent picture and sound performance of this unassuming box. Sony's done a very good job here on these meat and potatoes basics and has thrown in a lot of features and functionality for the money. If you've been wanting to get into Blu-ray and have been looking for an accessible player that really delivers the experience without breaking the bank, this player is well worth your consideration.